Finally, I have included a glossary in my blog. 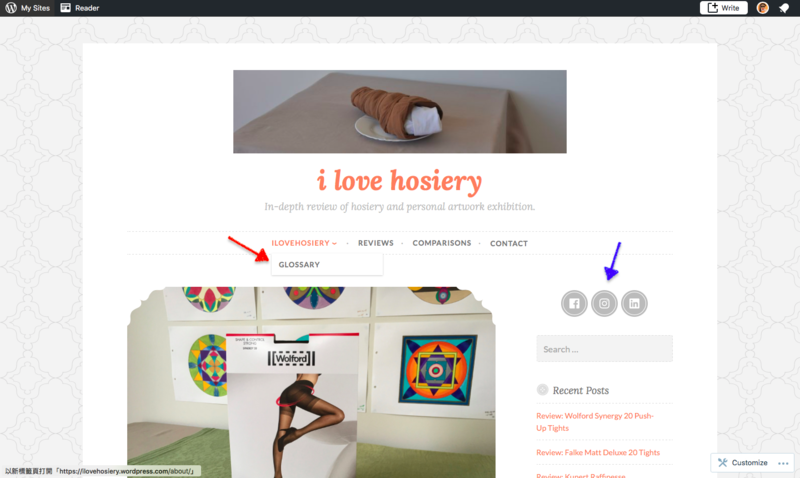 It is located under the “Ilovehosiery” menu for now (see image below). I have been compiling the list since I started. If you are reading my reviews and suddenly you find a term unfamiliar, perhaps you can find the answer in the glossary. By the way, you can now access my Facebook, Instagram and LinkedIn via the link at the top right corner of the blog. Red arrow: location of glossary. Blue Arrow: link to my Facebook, Instagram and LinkedIn. Last month’s review was a mix of pattern and basic essentials in 20-30 denier. If you miss reading any of them, you can find the links below. If you are new, there is a review menu, where you can find all my reviews in alphabetical order. February is the month for spring/summer collection to be onstage. Both UK Tights and Luxury Legs has rolled out Oroblù’s new collections, a step ahead of the official website. Wolford has already added their second batch on their website. Although no public announcement, Fogal has a collection of new items in the New Arrivals webpage. No doubt there will be more coming. To celebrate the 111th year, KUNERT is offering something special each month. In February, they are discounting 30% on Show Your Secrets Range. Simply use code: 111februar at check out. You can browse the range via the link below. This is going to be another busy month for me. I doubt I can publish additional articles apart to the usual three review. We will have to see. In the meantime, happy valentines day.